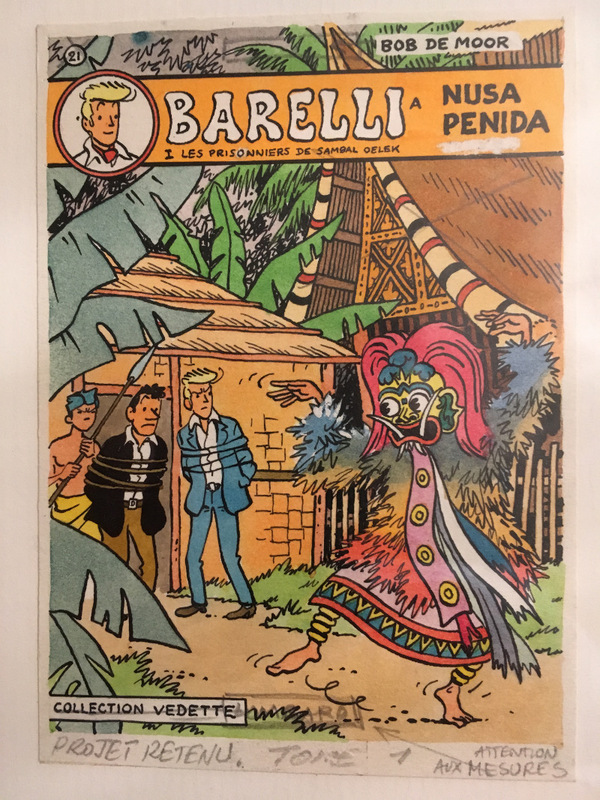 In the period 1982-1983 Bob De Moor created an extended version of the Barelli story “Barelli à Nusa-Penida” (volume 1 & 2), which was originally published back in 1951 for the Tintin Journal. The recreated versions were released in album format via Le Lombard with new/reworked pages and other cover artwork. And that’s precisely what we will talk about this time. 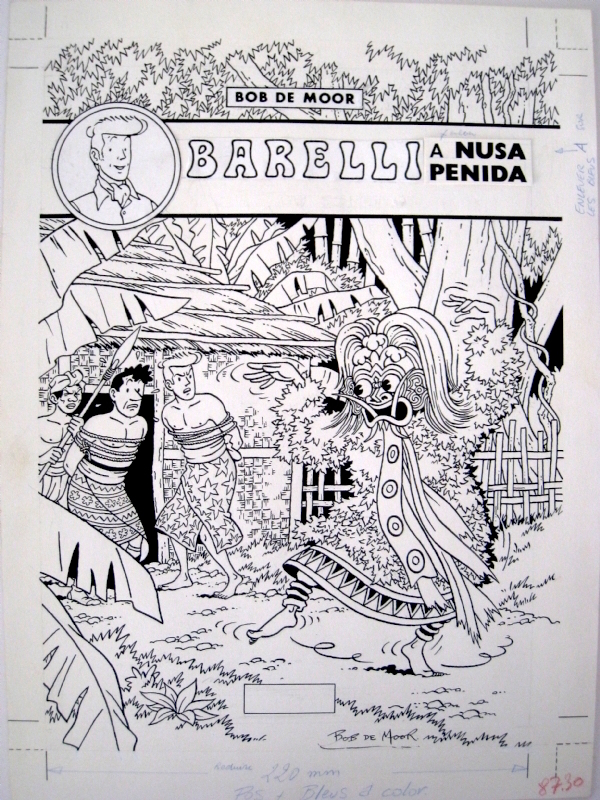 While talking with Noël Slangen for this article he mentioned he had a test version of a certain Barelli album cover. Since we know that some of these test versions are real gems, we asked if he could send us a picture. Two days ago we received a photo of said cover and behold, it’s a test version of “Barelli à Nusa-Penida (volume 1)” (version 1981)! There are some interesting details regarding this version. The 1st volume is called “1 Les prisonniers de Sambal Oelek” on this test version and not “L’île du Sorcier” like would be the case in the final version as published by Le Lombard. The number 21 (see the top left corner) also has vanished in the final version. Interesting to see, De Moor had added ‘collection vedette’ in the bottom left corner, but the album would in the end be released as a normal Le Lombard album (that was about time!) as the cheaper ‘collection vedette’ had ceased to exist as a standalone brand by 1977; the album “La grotte aux esprits” in the Les 3 A series being the final one (n° 50). As a result you see a pencil comment to bar ‘collection vedette’ and instead put the Le Lombard logo (here abbreviated as ‘Lombard’) in the bottom center. The same goes for Bob De Moor’s name which moves to the top middle. In the final version Bob De Moor would clear some space for the logo (by bending the sorcerer’s body posture, thus making him smaller) which is also demanded in another comment on this test version (‘attention aux measures’) in the bottom right corner. Note also that this cover artwork is one of several submitted to Le Lombard, the ‘project retenu’ comment indicates this clearly. 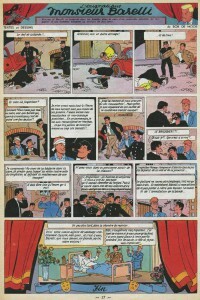 The cover idea is based on the 1951 version as used in the Tintin Journal nr. 151 as you can see below. Lots of thanks to Noël Slangen for revealing this beautiful gem! 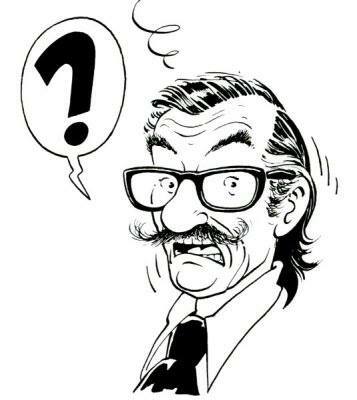 Today’s article was triggered by a mail we got from Petja van den Hurk who pointed us towards this blogpost by Peter Velter on the Joost Swarte website. The article recalled an aborted project from 1975 to unite a number of comics by well known underground authors in one album. But although the project never got realised, Velter did compile the works by Joost Swarte and Bob De Moor in a new book, “Blijf Kalm, Werk In Uitvoering”. The book (rather a magazine) itself is a quite limited edition and was only made available to people close to the project and the artists themselves (or their family in the case of Bob De Moor). You can preview the book right here. One drawing stood out and that’s an alternative cover for the Barelli album “Bonne mine à la mer”. There are a few things to say about the cover. First of all you will notice that De Moor already made a previous version on the same page and then placed a newer version on top – you can see the border right under the heading. A detail is also that De Moor had no idea yet what number the album would be in the Collection Vedette. And significant is that the artwork was immediately in French (many people still think erroneously that De Moor first wrote his scripts etc. 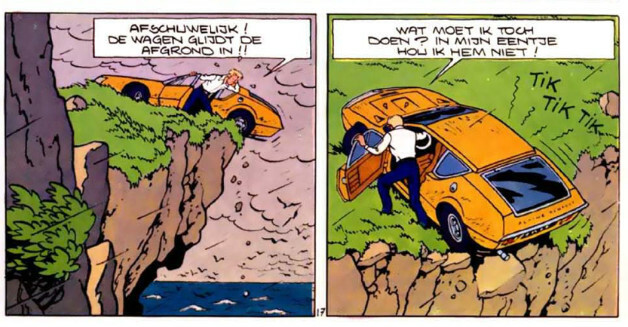 in Dutch). In 1975 Bob De Moor would see the “Bonne mine à la mer” album released via Le Lombard. It would be the only full album released so quickly after being published in the Tintin journal (n°6-14 1974). It was the follow-up album to the 1972 story “Barelli et le Bouddha boudant” and through 32 pages Barelli discovers the world of the radio pirates which often broadcasted from boats in the late seventies. The alternative cover is based on page 17 of the album, more precisely case 7 and 8 as you can see below. 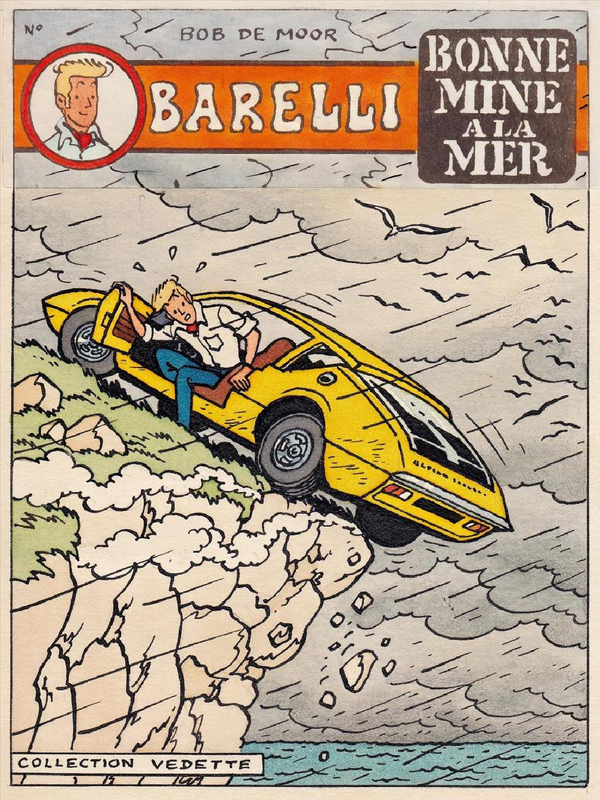 It shows Barelli’s yellow Alpine Renault almost falling off a cliff. The composition of this alternative cover looks quite dynamic with falling rocks etc. but perhaps it didn’t really represent enough the red line of the album, namely radio pirates. So in the end De Moor would go for the rubber boat heading towards a radio pirate boat. The album was most recently re-issued by BD Must editions and is an absolute must for Tintin fans as you will recognise many scenes which will immediately show you what drawings Bob De Moor worked on for the Tintin albums around that time. During the 60s and 70s, Lombard would publish several collections at a rather moderate price. The low price also had as a result that the French versions didn’t come in the normal hardcover versions but – very unusual on the French speaking bookmarket – in a cheaper paperback version. The stories were often also shorter, 32 instead of 44 pages. The 1976 version of “L’énigmatique Monsieur Barelli” as released in the Collection Vedette. In the Collection Vedette, released between 1970 and 1977, Lombard would present 50 titles. It was a follow-up to the Histoires du Journal Tintin collection. A few authors only saw a release of their albums in this format and thus never saw a hardcover release. Nevertheless, the collection holds several pearls and this not only from Bob De Moor‘s Barelli but also from Mitteï (Les 3 A), Uderzo (Oumpah-Pah ), Dupa (Chlorophylle), Greg (Rock Derby), Attanasio (Spaghetti), Tibet (Le club des Peur-de-rien), and so on. In short, it would be rather short-sighted to consider this collection to be the graphic dustbin of Lombard. 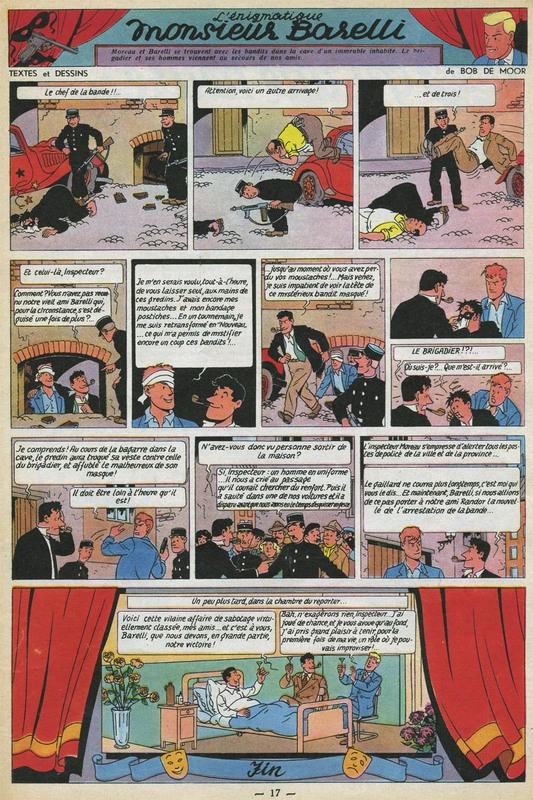 The final page of the 1976 version of “L’énigmatique Monsieur Barelli” as released in the Collection Vedette. 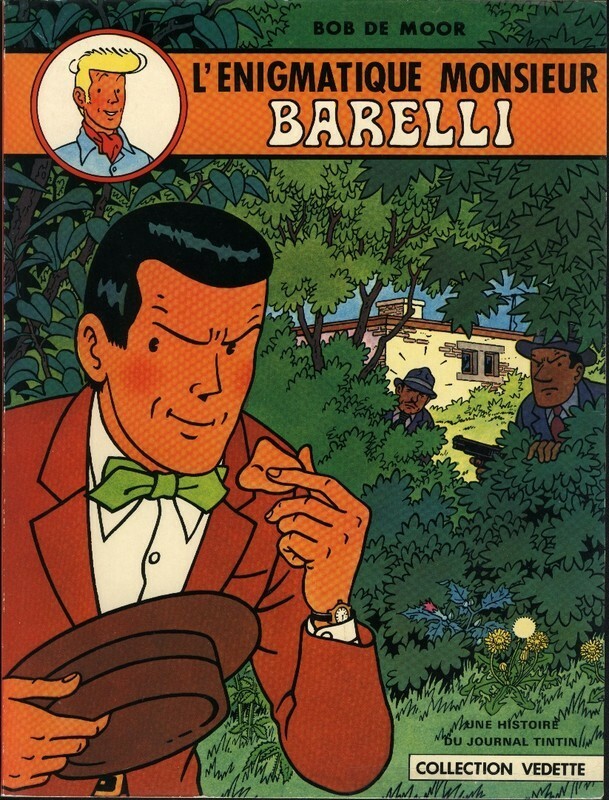 One of the Barelli stories published in this collection is the 1976 paperback “L’énigmatique Mr Barelli”, originally published in the Journal Tintin in 1950 – 1951 and in 1956 in album format. This 1976 version stays faithful to the original version and thus holds 14 pages less than the later released versions in the 80s. The 14 extra pages were added to fit Lombard’s new album concept demand. The original last page from that 1950/1951 story is the one you see on the left. We’ll get back on all these differences later on. Rejected cover artwork for the 1976 version of “L’énigmatique Monsieur Barelli” as released in the Collection Vedette. But let’s get to the point of this post. Bob De Moor would create several cover projects for the release of this particular album in 1976, and more than just one design would make it in album format one way or another (the 1980 version is different from the 1976 one for instance). But one project never made it to publication and that’s the one we present today (thanks Alain Demaret for the hint!). 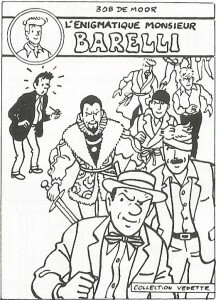 The cover shows Barelli in various disguises including The Merchant of Venice – he is an actor after all – with Inspector Moureau looking quite surprised. Perhaps this project looked a bit too disturbing or unclear, so it never made it to the next stage. 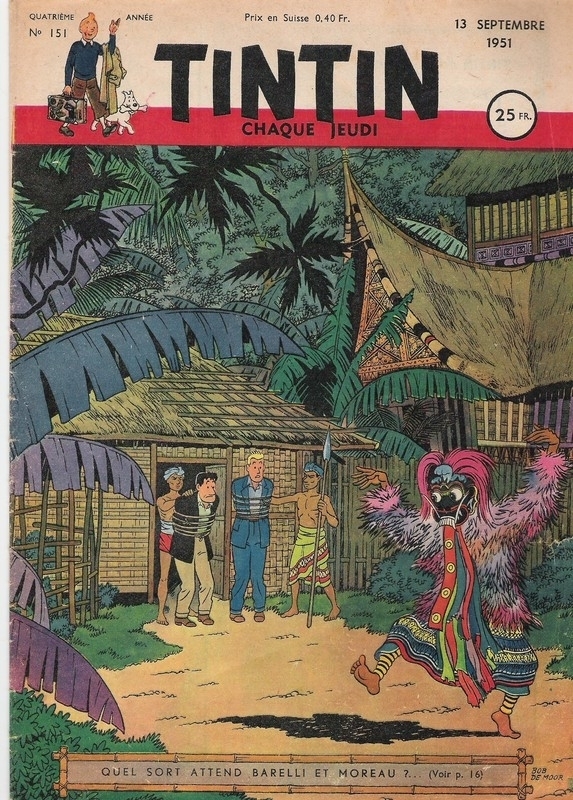 A small print of this cover was released in the big-sized “Le Lion de Flandre” released by Éditions Michel Deligne in 1976. This proves that the drawing indeed comes from the very same session as the final artwork for this 1976 Collection Vedette album.